The frost monster has made his way into the lava world to grab a mysterious sword from the lava rock! Whoever has it in their possession is practically untouchable as they are protected against the other elements. The element of the world in which it is located also spreads out into all the surrounding worlds. The frost monster needs the super weapon to prevent the spread of the lava world and to save his ice world. But the mission is dangerous. The weapon is stuck in lava rock deep inside the lava world and is being watched over by the red-hot fire lion! He is almost invincible thanks to the sword. But only almost. 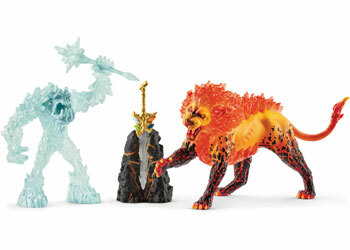 The frost monster can outwit the fire lion with his gigantic flail which has razor-sharp spikes of ice! And anyone who comes into contact with his spikes is immediately frozen. Fire against ice the epic battle begins!